Alcohol: Alcohol not permitted on the premises. Speed Limit: Five miles per hour is the official speed limit. Glance at your speedometer while driving, otherwise you might exceed the speed limit. Protect the children - obey the speed limit! Courtesy: Courtesy and consideration for other campers should be first and foremost at all times. Occupancy: One family (household) per site. Sites are assigned based on services desired, type of camping gear, and ages of family members declared at time of reservation. Camp Fires: Permitted 7:00 a.m. - 11:00 p.m. Fires and firewood should be kept small and contained within the fire ring (state law). Please put your fires completely out by 11:00 p.m.
Mats and Carpets: Maximum size for mats and carpets is 2'x3' (door mats only). Larger mats kill the grass. Quiet Time: 10:00 p.m. - 7:00 a.m. Youth/children should be at their own campsite under the supervision of an adult. Singing/musical instruments finished. Radio/TV/CD/Etc. : Audio and video devices are permitted only with earphones. If used on RV sites, they're permitted only within the RV and kept low enough so as not to be heard beyond your site perimeter. Tent Campers: Please do not dig trenches. If your tent is on grass, the tent should be moved after four (4) days to prevent the killing of the grass. Ground tarps should not extend beyond tent base. Picnic Tables: Please do not use hooks or nails. Please do not remove the table from the site. Singing/Musical Instruments and any sound-creating activity should be kept low enough so as not to disturb other campers. This type of sound is not permitted after 10:00 p.m. or before 7:00 a.m.
Check-in: 2:00 p.m. - 9:00 p.m. 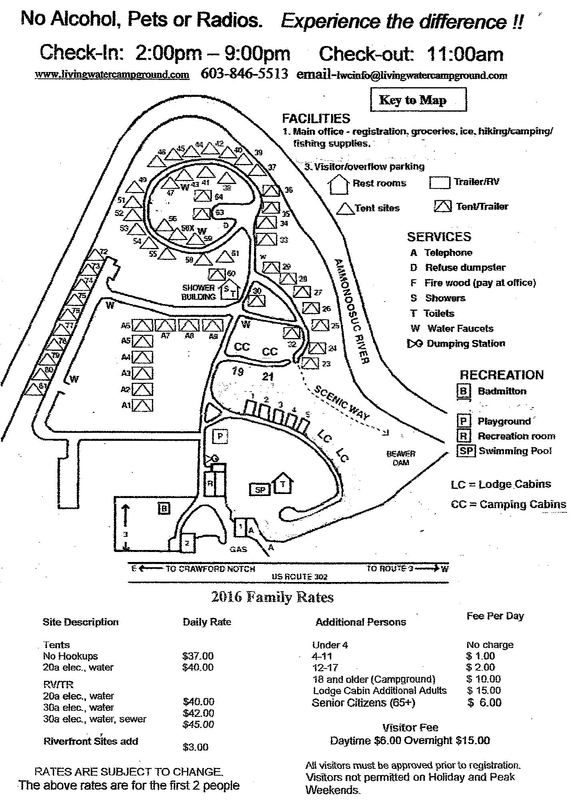 Visitors: 9:00 a.m. - 9:00 p.m. Visitors are pre-approved on a visitor-by-visitor basis. There is a fee charged. Visitors must register and are subject to campground rules. Additionally, visitors are not permitted on holiday and peak weekend days. Additional Autos: One vehicle is permitted at the site. Additional vehicle parking is available on the upper campground. 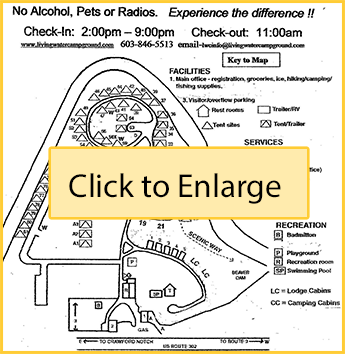 You will be charged a $10.00 fine for each occurrence of an additional vehicle parked at the campsite. Personal Demeanor: Profanity, immodest dress/behavior, and disorderly/obscene or contentious behavior are not acceptable. Restrooms: Restrooms are closed for cleaning midday daily. An adult should accompany children under eight (8) to the restroom. Our showers are not metered. Playground/Pool: Open 8:00 a.m. until dark, mid-June until Labor Day. Children under 14 are to be accompanied at the pool by an adult (state law). Pool rules are posted at the pool entrance gate. Trash Disposal: Trash pickup is not provided at your site. Please do not leave refuse at your site, and do not leave trash outside overnight. Instead, place all refuse in the dumpster behind the trading post. Trash bags are provided at the camp store. Minibikes, Scooters, ATVs, Etc. : Chainsaws, firearms, fireworks (caps/sparklers included), and anything else that goes bang or presents a possible danger or hazard are prohibited.